Archaeologists at the University of Birmingham are heading to Stonehenge to lead the Britain’s biggest-ever virtual excavation, a far from superficial look at the Stonehenge landscape. The Stonehenge Hidden Landscapes Project will use the latest geophysical imaging techniques to visually recreate the iconic prehistoric monument and its surroundings as it was more than 4000 years ago.Update 22/07/2010 First result is the discovery of a henge, about 900m from Stonehenge itself. Magnetometer images & photos here. The Stonehenge Hidden Landscapes Project, started early July, aims to bring together the most sophisticated geophysics team ever to be engaged in a single archaeological project in Britain to work alongside specialists in British prehistory and landscape archaeology in a three-year collaboration. “We aim to unlock the mysteries of Stonehenge and show people exactly what the local area looked like during the time the monument was created,” explains project leader Professor Vince Gaffney, of the University of Birmingham’s Institute of Archaeology and Antiquity. 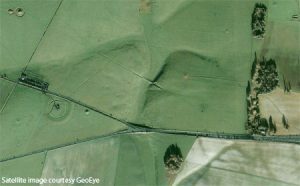 The scientists will map the Wiltshire terrain as well as virtually excavate it, accurately pinpointing its buried archaeological remains. When processed, the millions of measurements will be analysed and even incorporated into gaming technology to produce 2D and 3D images. No landscape deserves to benefit from study at this level of detail more than Stonehenge. Professor Gaffney (who earlier this week won a British Archaeology Award for his book ‘Europe’s Lost World – The Rediscovery of Doggerland’) believes the survey will shed light on the origins of an area which, despite being studied by antiquarians and archaeologists over many centuries, remains largely terra incognita. Stonehenge is recognized as UNESCO Heritage Site as ‘Stonehenge, Avebury and Associated Sites’. It is obvious to all who visit the area (soon you can do so using the Stonehenge Avebury Link bus service) that the world’s most famous prehistoric monument is not just an isolated circle of stones. Exploring the landscape, you’ll discover that there are other stone circles and henges, as well as barrows, mounds, hills, settlement remains and even a hill figure that are splendid reminders of Britain’s ancient past. The project begins midway through one of Stonehenge’s busiest tourist seasons for years. With more than 750,000 visitors annually, half from overseas, the site is one of the UK’s most popular tourist hotspots. While visitors flock for a glimpse of the world-famous monoliths, the 12-strong Hidden Landscapes Project research team and their equipment will be spread over an area spanning four kilometres this year and a total of 14 over the next three years. On that ‘surface area’ (yet, a thorough geophysical survey looks belowground as well) you’ll find Stonehenge itself, the Normanton Down barrow cemetery, Bush Barrow, the Stonehenge Cursus and – of course – the Avenue, a 3 kilometre long pathway aligned with the solar patterns of the summer and winter solstices. The multi-million-Euro study is funded by the new Ludwig Boltzmann Institute for Archaeological Prospection and Virtual Archaeology in Vienna and the University of Birmingham and is assisted by the National Trust and English Heritage and the Division of Archaeological, Geographical and Environmental Sciences at the University of Bradford. “Rather than looking at typically small discrete areas we intend to cover the whole of the World Heritage Site. We will do this using emerging technology that allows us to pull large banks of sensors behind a quad bike and using real time GPS to locate the measurements,” explains Dr Christopher Gaffney, Lecturer in Archaeological Geophysics at the University of Bradford, his department’s involvement in the Stonehenge Hidden Landscapes Project. Technology is becoming more and more important in archaeology, with geophysical surveys and 3D modelling helping researchers make new discoveries, reassemble or further study known sites and even allows them to make digital ‘back-up copies’ of our heritage. A short preview video of our virtual areas such as Stonehenge, King Tut’s Tomb, the Terracotta Warriors museum, and a reconstruction of the Assyrian Lion Hunt. If you are from the UK – or plan to visit London soon – you should start exploring in the Virtual Valley of the Kings and find the driver, for a chance to win £1,000 worth of travel with Addison Lee. I’m definitely looking forward to the Stonehenge Hidden Landscapes Project’s results, and incredibly curious which uses – besides digital digging – the team has in mind for the 3D data generated. In the mean while, the most impressive example of virtual reality visualisation for archaeology I’ve seen is USA-made, and Wessex Archaeology’s Stonehenge Landscape is the finest 3D model (and ‘aerial tour’) of the area. * For health and safety reasons we advise the following technique for lifting a virtual Stonehenge trithlon: Have your desk chair at the right height so your eyes are level with your screen, your knees slightly lower than your hip joints and your feet sat flat on the floor rather than tucked under your chair. Rest your wrists on the desk and press down on the left mouse button to move the 50 tons virtual Sarsen.